To set the mood for this post, I’m going to need to throw it back to my dons Cassidy, R.Kelly and Pitbull. Any time I know I’m going to be staying in a hotel these songs infiltrate my mind, so why not press play whilst you read about the top 10 favourite hotels I’ve stayed in. 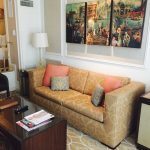 Central Park is literally around the corner and Times Square is only a few blocks away, so in terms of location, The Quin is perfectly situated. If you wanna stock up on food and drink too, there is a Duane Reade just across the street as eating out in NYC can be pricey. This was left on my bed after I told the concierge about my hangover. 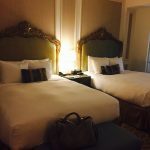 There are a plethora of hotels in NYC to choose from depending on your tastes and budget but if you’re after something boutique yet luxury, The Quin is for you. 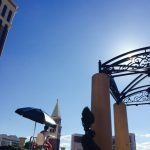 My first time in Vegas was an experience; I wouldn’t recommend going in mid-August (42C and upwards) but I would recommend staying at The Venetian. It can only be described as opulent, decadent and entirely luxurious in every way possible. 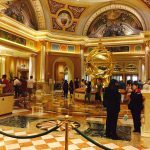 From the lobby to the seven pools to the huge rooms, The Venetian has it all. I loved the bathroom (which is bigger than my London bedroom) but what I loved more was the decor in the lobby. 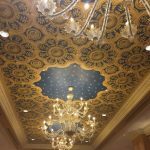 If you’re in love with all things Venetian, you may just be able to cross that off your bucket list after staying here. Ironically, I’m heading to Venice next week as I’m not sure I can do a 4th Vegas trip. Pricewise, the 5* hotels are relatively cheap compared to other areas of the globe but you’re never spoilt for choice in the City of Sin, so take a gamble. I also stayed at The Mirage last year and whilst it was lovely and was in brilliant location, it didn’t make it to this list. I think once you’ve experience staying at a 5* hotel in Vegas it’s hard to go down. That’s probably the boujiest sentence I’ve ever typed BUT my take on travel is affordable luxury. You can check out my bouji on a budget hacks here. The Grand Palladium in Puerto Vallarta exceeded my expectations and more. I’m always wary of booking a resort hotel as the scenery is usually amazing but the service isn’t. However, The Grand Palladium was absolutely amazing, from check in to check out, the staff go above and beyond in every single way. My favourite moments were ordering room service which is included in your all-inclusive offering and of course watching the sunset every night. I wrote a post about why I fell in love with Mexico here and I’m sure you will be if you take a trip too. Famous for hosting the Golden Globes and plenty of other star-studded events, The Beverly Hilton is nothing short of iconic. The rooms are a little (just a tad) outdated, but the hotel itself and staff are absolutely lovely. Not only that, in terms of location, you are right by The Beverly Hills sign and a 10-15 minute walk to Rodeo Drive. Luxury at your doorstep right? A special mention goes out to all the Travelodge hotels I’ve stayed at in the UK as although all these hotels may be budget the beds are comfy and exactly what you need for a trip in the UK. Check out my Cornish adventures here where I teamed up with Travelodge on the #SeaAndTheCity campaign encouraging Londoners to get out of the city for the weekend. This year, I want to attempt staying in a hostel and Temi from The Palateport’s post here might just tempt me. What are your favourite hotels you’ve stayed in? Let me know by commenting below or tweeting me here. 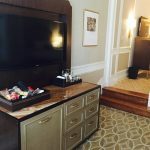 *So when I went to Vegas in October 2016, I stayed at the Trump and my room got upgraded… I would have included it in this list BUT you know why. Anyway feel free to peruse my Vegas adventures here if you’re intrigued as to what staying in a hotel made of gold is like. That Vegas hotel tho😍😍😍 looks amazing!! Love that you put those videos. I have always loved that first song. I also loved the Venetian! Thanks for some good recommendations here! Wow!! These hotels look so amazing! I can see why you would choose these. To be honest, I don’t think I could ever afford any of these places but would love to see their decor inside. Fingers crossed you do Michelle! This is sooo helpful, bookmarking this for when I next go away! Gosh you’ve stayed in SUCH cool places, thanks so much for taking the time to share your experiences with us. 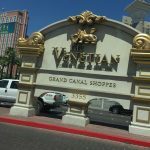 The Venetian is top of my list – 7 pools – whaaaat?!?! If you’re ever in Barcelona the Princess Hotel there is really nice and affordable, rooftop pool, floor to ceiling windows in the rooms etc. highly recommend! My husband and I are planning on going to Vegas for our 30th next year, so your Vegas recommendation was good! I need to start researching cool places to visit etc.